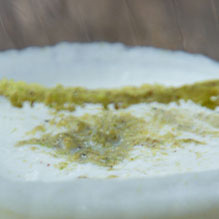 Pistachio Syrup:Blend pistachios and simple syrup until smooth. Then strain out the liquid. Cocktail: Combine all ingredients in a cocktail shaker with ice and shake vigorously until frothy. Rim rocks glass with crushed pistachios (optional). Strain into glass and serve immediately.